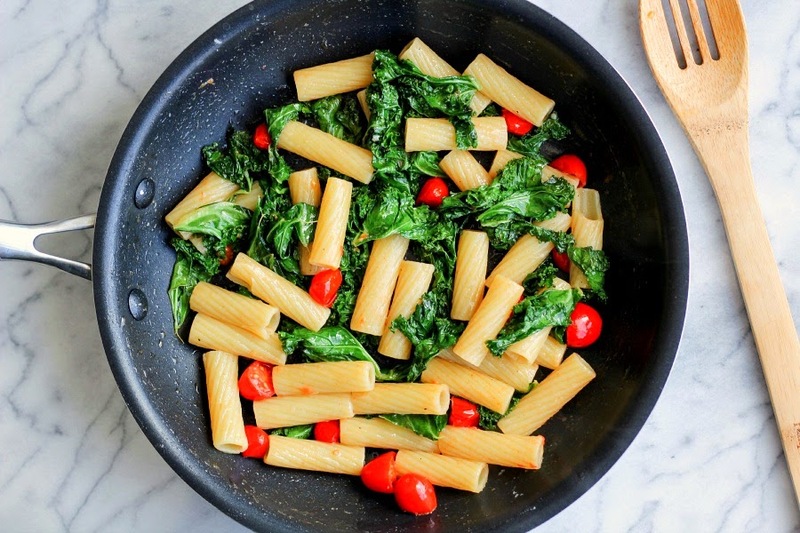 This simple pasta dish for one is hearty, healthy, and most importantly, delicious. Perfect for lunch or a light dinner! Lunchtime has always been a thorn in my side. Having worked from home for many years, I struggle more often than not with finding something to eat. It's funny, you'd think being a food blogger I wouldn't have trouble with this. But I do! And it stinks. I'll stand in front of the pantry and refrigerator searching for something good for such a long time. Sometimes I'll pull out leftovers, other times I'll have cereal. Yes, I did say cereal for lunch. (My son gets so made at me when he finds this out!) So lately I've been trying to plan ahead for lunches, just like I do for dinner. 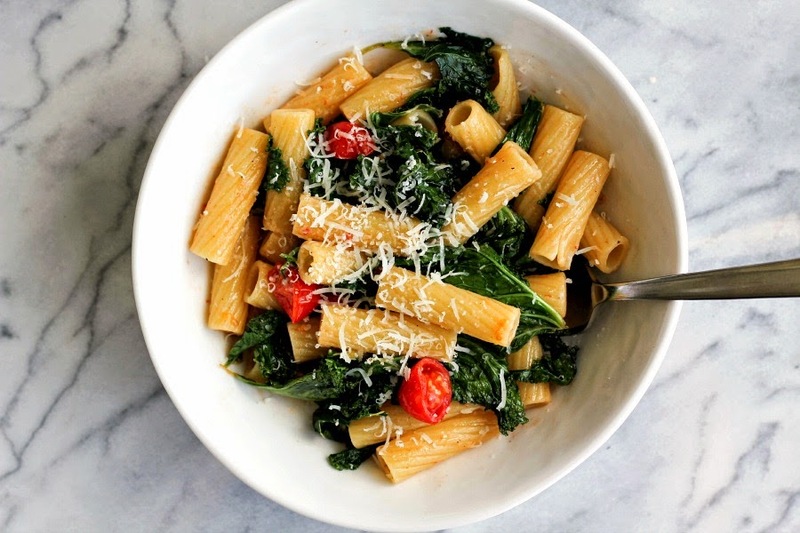 This pasta recipe is something that just popped in my head the other day. I LOVE brown butter, and I often make pasta with brown butter when I'm just cooking for myself. My kids like red sauce or alfredo, so I typically save the simple brown butter sauce when I'm eating alone. 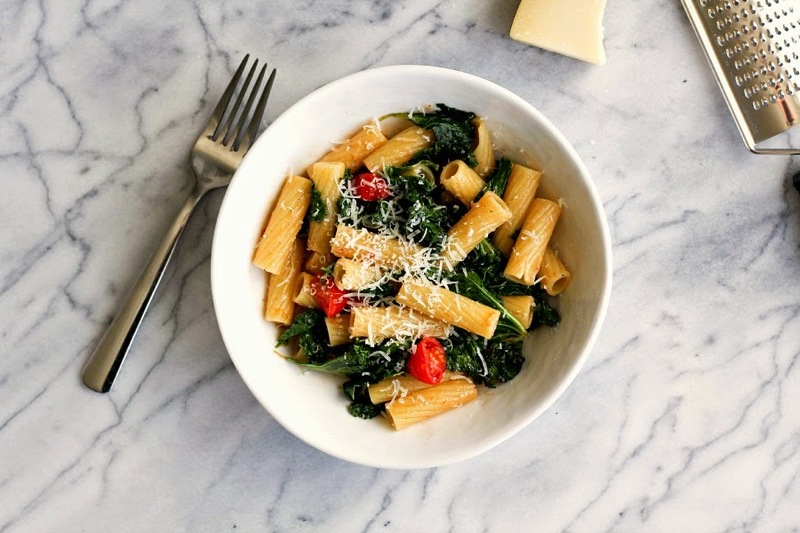 I had some fresh kale and cherry tomatoes and I knew they would be a perfect addition to this easy pasta dish. The best part is this cooks very quickly, so you can have lunch made in 20 minutes or so. I know you probably think a whole cup of kale sounds like a lot, but it wilts and will cook down quite a bit, so it's actually the perfect amount. This is my new go-to lunch! Hope you enjoy it as much as I do. Bring a small pot of water to a boil and cook pasta according to package instructions, pulling the pasta out about a minute earlier than recommended. While the pasta is cooking, melt the butter in a medium skillet over medium heat. Swirl the pan occasionally so the butter doesn't burn. After a few minutes it will start to foam, then turn from a light brown to a deeper brown. Once you smell a nutty aroma, the butter is done. Take the pan off the heat and add in the kale and tomatoes; sprinkle with a pinch of salt and pepper. Carefully toss the vegetables with the butter and place the pan back on the stove over low heat, allowing the vegetables to warm through. As soon as the pasta is done, add it to the pan and toss to combine. Pour the pasta into a bowl and grate the Parmesan cheese over the top. Serve immediately.